Long-married spouses often develop similar patterns of speech. A boy might learn to walk just like his father, and a girl might favor the same hairstyle as her mom. Teenagers in the same cliques dress alike and cut their hair in a similar fashion. It is natural to adopt the traits of the one you love, to mimic their behavior, dress, speech, and habits, consciously or unconsciously. Lover and beloved converge, master and disciple unite, leader and follower bond. Today’s saint did not have a reference group apart from Christ Himself. Jesus Christ inhabited every corner of the mind, soul, and imagination of Saint Pio of Pietrelcina. Pio’s life fused with Christ’s so totally that Pio’s very body bore the marks of his beloved. Not the same haircut, clothes, or gait, but the same nail marks and bloody wounds. Father Pio merged with Christ such that to look upon the friar’s hands was to see the crucified palms of the Son of God on Calvary. Padre Pio grew up dirt poor and uneducated in a village near Naples, Italy, in 1887. Neither his parents nor his grandparents could read or write. He was baptized as Francesco and helped on the family’s small plot of land as a boy. The family was deeply religious, in the good, medieval way that perdured in rural, southern Europe far longer than it did in northern lands. Saints, feast days, devotions, processions, fasts, the Mass, angels, saints, the Virgin, and God saturated the atmosphere of Pietrelcina. Little Francesco and his family breathed Catholic air. It entered their bloodstream, circulated in their veins, and oozed out of every corpuscle. When he was about ten years old, Francesco decided to dedicate his life to God as a Franciscan friar. After completing some schooling and being privately tutored, he entered a nearby Franciscan friary at age fifteen. He took the name Pio (Pius) in honor of a saint honored in his hometown. He was ordained a priest in 1910. Padre Pio lived virtually his entire priestly life at a modest Franciscan friary in the rural town of San Giovanni Rotondo. Beginning in 1918 he began to experience the stigmata, or marks of the sufferings of Christ. He bled where Christ bled. Holes perforated his hands. He had sharp pains in his side. He also began to display supernatural gifts: bilocation, prophecy, miracles, and healings. His personal routine of prayer and mortification was itself stupefying. He did not want his private passion to play out in public, but it did. He became famous in Italy for being holy. Then he became widely known the world over. By the time of his death in 1968, Padre Pio was a bona fide Catholic superstar. Padre Pio had mystique. That mystique was not rooted in good looks, a chateau on the Côte d’Azur, or in movie roles. It was how he said Mass. People flocked to witness Padre Pio say long, intense, devotional Masses. In the modern world, sin has mystique. It’s cool, retrograde, impulsive, and “edgy.” A life of sin and vice is seen as more authentic than a life of goodness and virtue, because the sinner does not hide his real self behind a social curtain. Padre Pio hid nothing. He was totally authentic, totally sincere, and totally holy. His life was a rebuke of sin. He did not fake “share” others’ burdens by joining them in sin. He entered into the real drama of life by embodying Christ. A true Christian is authentic when he separates himself and his friends from sin, when he creates the mystique of Christ around him, and, like Christ, draws all men to himself. 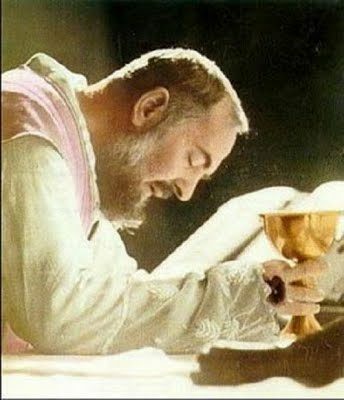 Saint Pio, your intense love of God was communicated to the faithful in your celebration of Mass, your wise counsel in the confessional, and in your mystical experiences. What was so manifest in you was rare, but lies latent in every priest. Help every priest to be an icon of Christ.